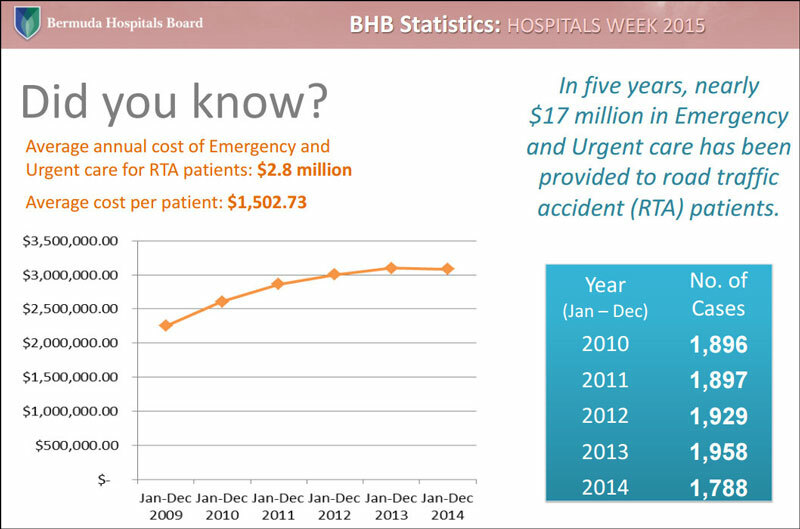 In five years, nearly $17 million in emergency medical and urgent care has been provided to road traffic accident [RTA] patients, and the average annual cost of emergency and urgent care for RTA patients is $2.8 million, according to statistics from the Bermuda Hospitals Board. The statistics – which are from last year’s Hospitals Week presentation — said that the average cost per patient is $1,502.73; and in 2010 there were 1,896 cases, in 2011 there were 1,897, 2012 there were 1,929, in 2013 there were 1,958, and in 2014 there were 1,788. Drastically raising the level of rider training and education is one sure way to change this. The cost in terms of personal suffering, lost job productivity, and vehicle repair is of course much much higher than that. In other words, the Police abandonment of much traffic control has a tremendous cost to our economy. I am told that the police now start speed ticketing at 55-60 kph – that’s double the speed limit. So this tells us that the initial hospital cost to individuals and or their insurers is $1,502.73 but that the number of patients treated is on the decline. Who are we going to blame for this one? Not your uncle Bob ! Start with the 14 people who “dislike” my driving tutorials.